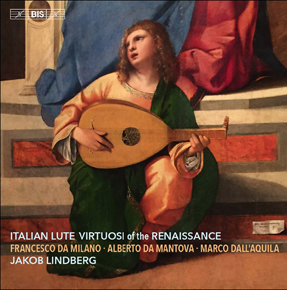 "Encompassing Fantasias and Ricercars, song intabulations and dances, Lindberg's own 'suavity of sounds' creates its very own soul music, especially in the Fantasias by [Francesco) da Milano that bookend the disc and are woven throughout. There is a sense of eavesdropping on a spontaneous yet eloquently-argued soliloquy. Colouring is subtle, conversational banter deftly managed, and Lindberg's tempos always spot on allowing the music to breath (as does the exemplary recording).... A captivating conspectus of a golden age aglow with confidences and delights."